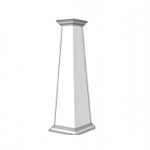 At Elite Trimworks, our attention to detail and devotion to the classical orders are absolute. 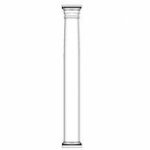 Due to the standards of our workmanship, we produce columns to meet your individual uses and needs. We closely control the quality and preciseness of entasis, projections and profiles of all our columns. Our interior wood columns can be used purely for decorative purposes or for their structural load bearing capabilities. Our wood decorative columns are true to the orders most prominent architects and builders are looking for. 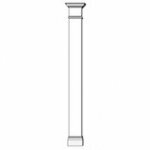 Many standard design columns are available for corner accents, massive exterior supports, lolly columns and much more. Both load bearing and decorative. Available smooth or fluted and can be split. For Contemporary Style Decorating, Load bearing as well. Available fluted and are both load bearing and decorative. In paint grade to match our Wall, Flat and Raised wainscoting. Fluted or Smooth, they range in width from 6" to 12" and from 6 to 12 ft high. Call for custom sizes. Generally used to separate rooms that share common walls or to add vertical separation on a wall. 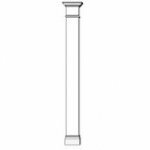 We do custom orders of any size, a pilaster is simply a square column cut in half. Choose for our standard or custom sizes. More choices than ever! An attractive alterative to drywall either round or square. Made specifically for wood column shafts. Helpful tips, specifications and installation advice on how to install columns. PVC Hardware Kit: Four wood screws for the column shaft, and four Tapcons to fasten the cleats to a cement base. Most of our columns include two PVC cleats and this hardware kit. Having the right hardware on hand can be a big time saver on the job site.